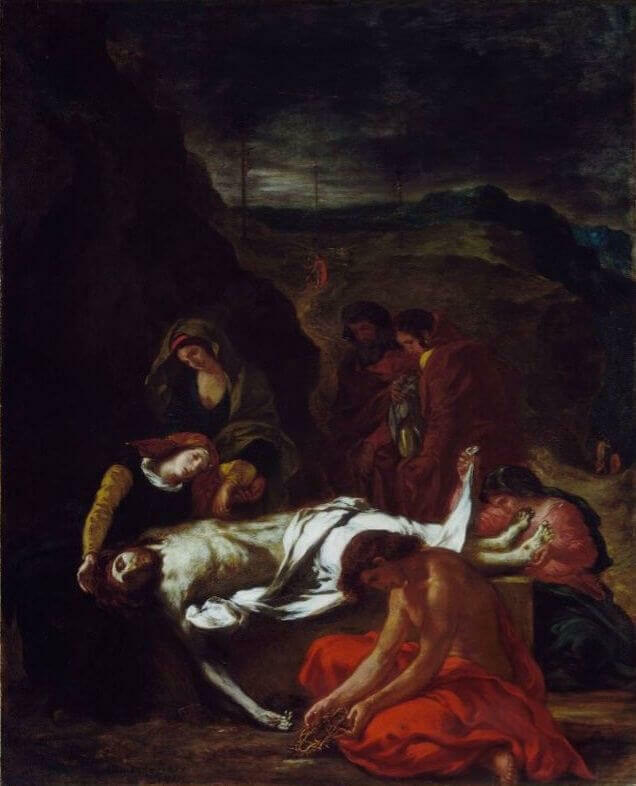 Delacroix left us considerable information of the highest interest about the execution of this picture, exhibited at the Salon of 1848. As early as February 1, 1847, he composed it, making a rough draft on the third of the same month, and on the fifteenth resuming the interrupted work, and writing: "... My draft is very good. It has lost some of its mystery, which is one shortcoming of a methodical draft. With a good design for the lines of the composition and placing of the figures, one can do without a sketch, which becomes virtually a duplication. It can be made on the picture itself, by leaving the details vague. . . ." Finally, on March 1, he noted again in his Journal: "After my meal, I went back to the Pieta: this was the third drawing session; and, during the day, despite a bit of malaise, I picked it up sturdily and put it in good shape to await the fourth stage. I am satisfied with this draft, but, when one adds the details, how can one retain that impression of ensemble which comes from very simple masses ? Most painters, and I used at one time to do the same, start with the details and create the effect at the end. Whatever unhappiness one may feel at seeing the effect of simplicity of a good sketch disappear as one fills in the details, there still remains much more of that impression than you would be able to give if you had gone at it the other way." Delacroix was particularly concerned with relationships of color and light in this picture, and, on March 2, after having considered several tones in his Journal, he ended: "... I tried very late to work on the background of the Christ. Reworked the mountains. One of the great advantages of a rough draft for shade and effect, without paying attention to detail, is that one is necessarily led to putting in only those that are absolutely essential. Starting in here by finishing the background, I made it as simple as possible, so as not to appear overdone next to the simple masses which the figures still are. Reciprocally, when I do finish the figures, the simplicity of the background will allow me, even force me, to put into it only what I absolutely have to . . ."